Face it, there are sharks all over the world. From hammerheads to reef sharks, as a diver you are almost certain to encounter a shark at one time or another. Because sharks have such a bad reputation, they are often under appreciated. It’s time to make a change: Experience these majestic creatures in their native habitat, and allow yourself to be captivated their subtle beauty and fierce power. Cool and docile, nurse sharks are a great “starter shark” for those who are new to diving or apprehensive shark diving. Because they are nocturnal creatures, they spend most of their time during the day resting, giving divers a unique look at these dozy fish. Sometimes, thirty or more sharks will lounge together, a tangle of fins and gills. These introverted hunters spend most of their time near the sea floor, prowling around for a quick snack in the sand. The sharks will eat coral or shellfish, but prefer fish or squid. Nurse sharks are quiet, seemingly laid back creatures, and seem quite unconcerned with humans. However, they can grow to be intimidatingly large, up to 14 ft (4.3 m). Their iconic tail can be up to a quarter of their entire length, and is a powerful tool to get them where they need to go. They prefer warm water, and spend their time off the coasts of the western Atlantic and eastern Pacific, with some found off the western shores of Africa. The endangered grey nurse shark can be encountered while diving off Australia's coasts. 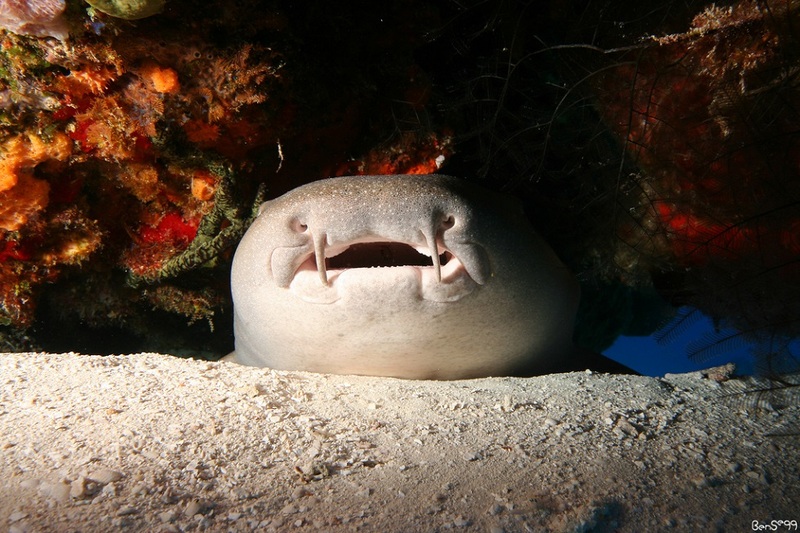 Though they can be casually spotted on any number of dives, some of the best nurse shark dives can be accomplished in Belize, off Ambergris Caye. Another great shark for those who are new to shark diving is the unexpected reef shark. There are several species of reef sharks, all of which cruise abundantly in waters around the world. The four different varieties of reef sharks are Blacktip, Whitetip, Grey, and Caribbean. Reef sharks vary in size by species: Whitetip reef sharks seldom grow larger than 2.5 ft (1.6 m), yet Caribbean reef sharks often reach 9.8 ft (3 m) long. Aptly named, reef sharks patrol coral reefs across the globe. Blacktips prefer to hug the coastline of eastern Africa, southern Asia, and northern Australia. Once they choose to reside in an area, they remain in the same region for long periods at a time, never straying far from their home base. You can dive with whitetips almost anywhere throughout the Pacific, especially in Southeast Asia. Usually nighttime hunters, you can find these sharks resting in shallow caves during the day. Grey reef sharks are found scattered across the Indo-Pacific, and are fast, fearless hunters. Though they are not the largest sharks on the reef, because of their dominating demeanor they are quickly regarded as top dog. They travel in large groups during the day, then split up as night falls to hunt. Caribbean reef sharks can be spotted only in Caribbean waters and down the eastern coast of South America. The Florida Keys offer some excellent places to dive with these agile creatures, as well as down the Caribbean coast of Central America. Because of their size, they are an apex predator on the reef. With a deep yellow back and pearly white stomach, the lemon shark is aptly named. Growing up to around 10 ft (3 m) long, lemon sharks reside in warm subtropical waters. Migratory creatures, they return to the same sites every year to breed or have their young, and generally stay near the coasts. You can find lemon sharks on either side of Central America and Mexico, as well as the Caribbean and eastern coast of South America. You can even find a substantial population along Africa’s western shoreline. Once a year, a dive shop in Jupiter, Florida takes visitors on a trip to dive with the local lemon shark population. As a bonus, these sharks lose their teeth quite frequently, and it is not uncommon to find a tooth or two during your dive. 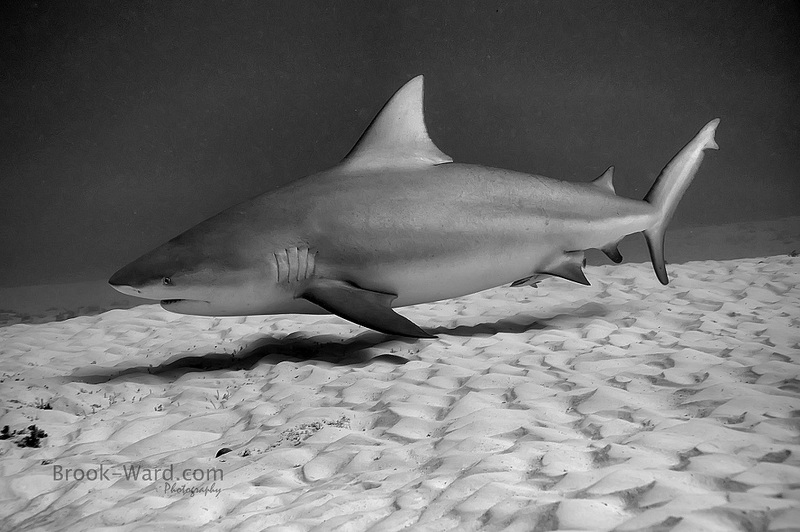 Bull sharks are smart and adaptable creatures, and are responsible, unfortunately, for the majority of shark attacks. They reside along coastlines around the world, found off every continent (except, perhaps, Antarctica). Because they can survive in both salt and fresh water, you can even encounter bull sharks in rivers and lakes around the world. Large, muscular, and stocky, bull sharks are not to be trifled with. Female bull sharks outweigh their male counterparts, and casually reach 7.9 ft (2.4 m) long. There have even been reports of sharks that are up to 13 ft (4 m). Because of their massive size, bull sharks are heavy hitters, and can weigh over 600 lbs (300 kg). They have the most powerful bite force of all fish. Known as "zambezi" in South Africa, you can go on baited dives on the Protea Banks, an fantastically beautiful place to scuba. Another of the most accessible places to dive with bull sharks is Playa del Carmen. There are several dive shops that cater to shark diving in this area, where you can readily come across these incredible creatures. One of the most mysterious shark species is the sevengill shark, also referred to as the "cow shark". It is a newly discovered, relatively unexplored shark, and much is still being learned about its unique habits. This prehistoric creature lives in deep offshore waters, often as far as 440 ft (130 m) deep. The sharks themselves are large, reaching around 9 ft (2.9 m). So far, they have been spotted off the coasts of South America, New Zealand, and Southern Australia, as well as South Africa. There is particularly excellent dive near Cape Town that comes highly recommended. You can also find the sevengills in the deep waters off the shores of China and Japan. Most recently, North America has gotten in on the action, regularly spotting the sharks in southern California. You could be one of the first to get up close and personal with this elusive creature. The sharks return to the San Diego and La Jolla kelp forests off the coast of California every spring, making for an ideal spot for observation. Visit from March through April for the experience of a lifetime. Another gorgeous shark that can be spotted off La Jolla Shores is the leopard shark, a docile and dazzlingly colored fish. 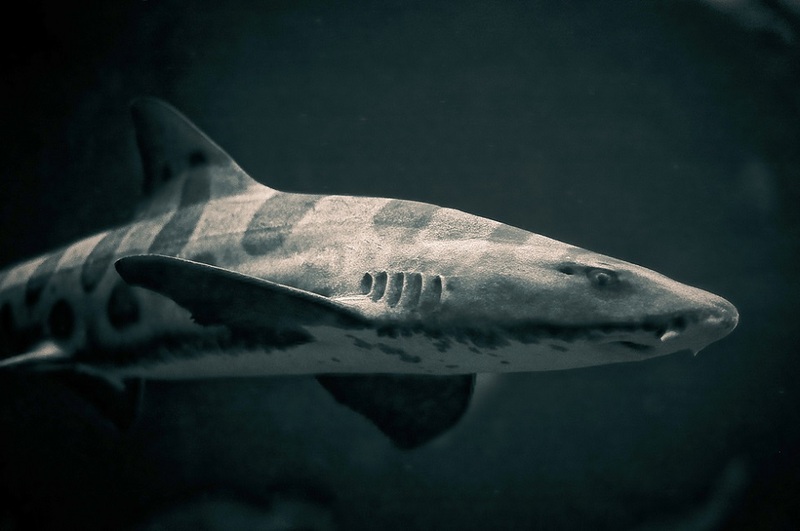 Dusky brown, the leopard shark has a pattern of bold dark spots running down the length of its body. 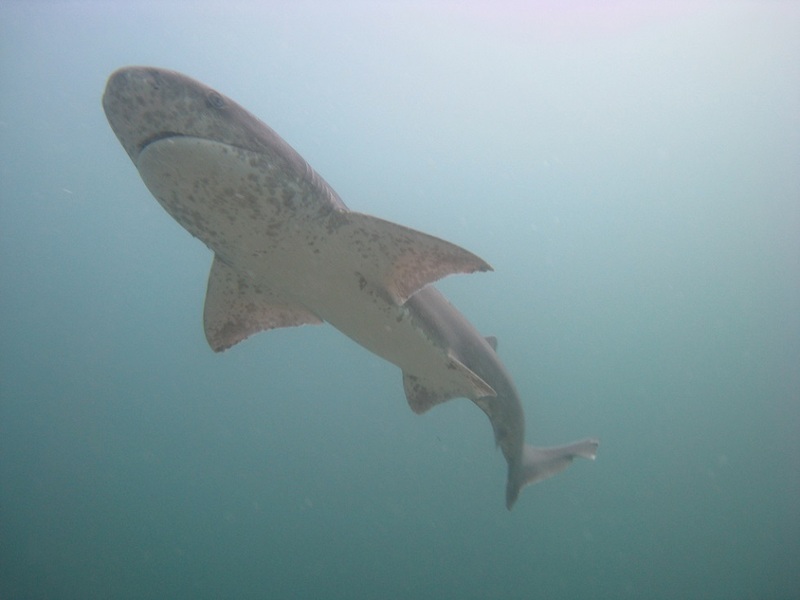 In addition to dives in Southern California you can also swim with leopard sharks while visiting Thailand, near Phuket. Particularly fond of kelp beds, they camouflage well with rocky or muddy bottoms. The sharks will also make their home in the shallows of estuaries and reefs. They move in and out with the tide, foraging for mollusks and shellfish. Leopard sharks are generally regarded as harmless to humans, but have been overfished in past years, leading to a decline in population. Incredibly large and powerful, tiger sharks easily reach 16 ft (5 m) and can weigh up to 1,400 lb (635 kg). Tiger sharks are so named both because of their telltale stripes that fade with maturity, and because of their intimidating hunting style, which makes quick work of their prey. Tiger sharks are said to eat literally anything that moves, making them one of the most dangerous fish in the sea. Even dolphins and whales avoid regions that are frequented by tiger sharks. 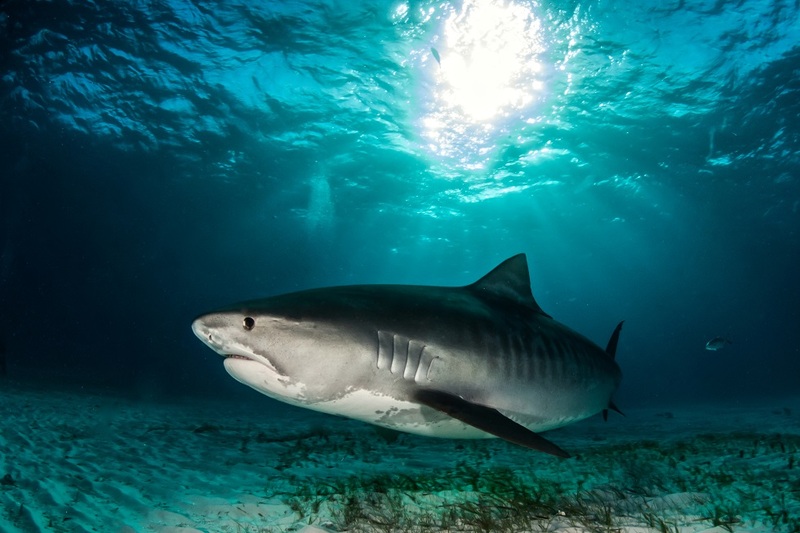 Tiger sharks stay close to the shoreline, remaining in tropical and subtropical regions, where there is enough food to satiate these large macro-predators. These tigers of the sea migrate vast distances over the year to remain in warmer waters. You can find places in Florida to dive with tiger sharks, from the town of Jupiter all the way down to the Keys. In the Bahamas you can do some cage free tiger shark encounters if you visit during the spring months. There is even an entire beach named for these massive stalkers, making it easy for you to happen upon a few on your journey. Iconic hammerheads are a classic favorite. There are many places where you can dive with hammerhead sharks, as you can find them along coastlines all over the world. There are ten known species of these odd fish, several of which are endangered or threatened species. These elusive and graceful sharks can sometimes be hard to find for divers, but there are certain locations where you can find them in massive schools. One such location is known as the hammerhead triangle, a collection of three islands where you can find a high concentration of sharks. These islands are Malpelo Island in Colombia, Cocos Island in Costa Rica, and the Galapagos Islands. 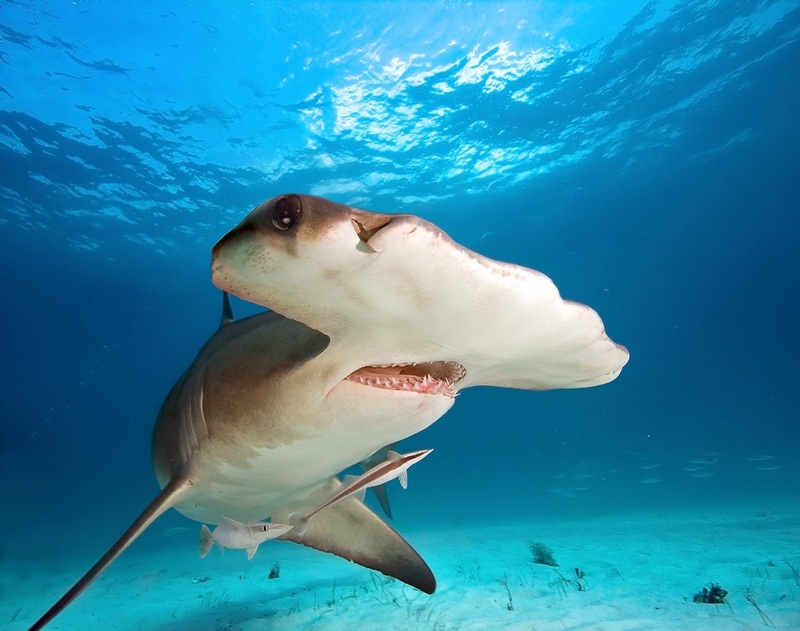 You can also dive with hammerheads in Hawaii, and all the way off into the Caribbean: from the Bahamas to the Florida Keys. Wherever there is an abundance of stingrays there is a good chance to find hammerheads. Stingrays are a treat for hammerheads, and you will frequently see the sharks gliding across the seafloor, seeking out the hiding rays. Perhaps the most vilified shark of all is the great white shark, the big boss himself. Cage diving with a great white shark is a humbling experience. With your adrenaline pumping non-stop you can watch the massive hunters glide by your cage, examining you with steely eyes. There are only a couple of places in the world where you can engage in this high octane experiences, the most famous being Gansbaai, South Africa. Gansbaai is the great white shark capital of the globe. In an area known as “shark alley,” you can see great whites feeding on the local seal population. During the sardine run, one of nature’s most awe inspiring migrations, great whites flock here in their hundreds, making for quite a show. 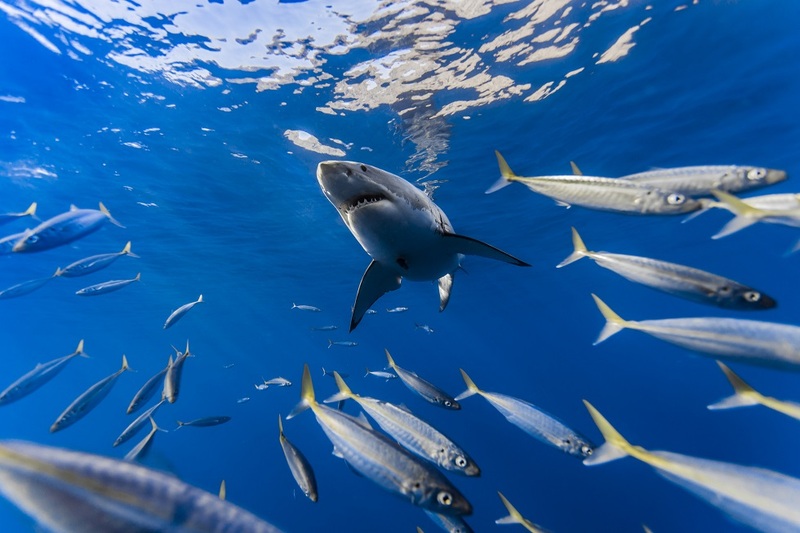 Two other excellent great white shark diving sites are Guadalupe Island, an island off the coast of Mexico, and Farallon Island, off San Francisco. Each shark encounter is different, so why not go for the trifecta, and try them all? Diving with a whale shark is an unforgettable life event. Whale sharks are the world’s largest fish, by far. Only from beneath the water can you appreciate their true size, next to which you will feel quite small and insignificant. The tremendous creature is a filter feeder, and eats primarily plankton and other small sea creatures. No whale shark has ever killed a human being, and as the massive, dappled fish glides past you any anxiety you may feel is completely replaced with wonder and awe. Whale sharks can grow up to 40 ft (12 m), and weigh over 30 tons. Despite their size, relatively little is known about whale sharks. There are only rough estimates as to the total number of whale sharks, their migration patterns, and on how best to approach conservation. Though it can be tempting, as a diver do your part and don’t have contact with the whale shark. Not only could disrupt them, but there is even a law against it in the Philippines. 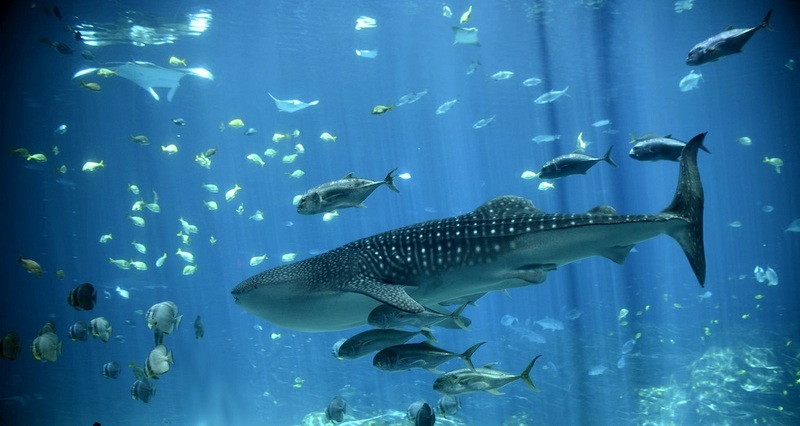 The absolute best places to dive with whale sharks are Ningaloo Reef in Australia, and in the Gladden Spit in Belize. Whale sharks are found all over the world, wherever the water is deep and warm. Whether you trek to Honduras or Mozambique, the Philippines or Ecuador, there are ample opportunities to get an up close look at these tremendous creatures. Sharks make for exhilarating diving buddies, one moment casually gliding to and fro, the next minute dashing and jerking; on the scent of their prey. 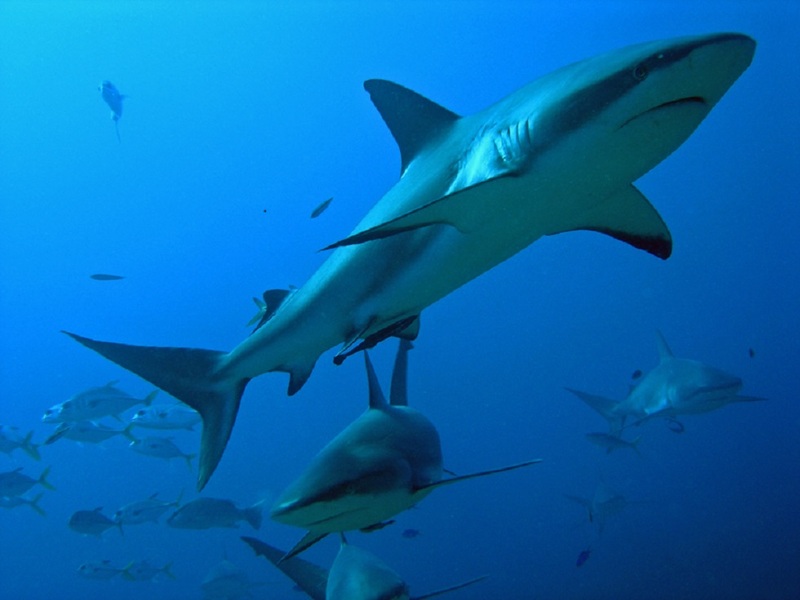 Whether your goal is to free dive with sharks or you prefer the relative safety of a cage, diving with sharks may be fearsome, but it is undoubtedly rewarding. There are around 400 species of sharks roaming the endless blue, from gigantic whale sharks to tiny dwarf sharks. Make it your mission to dive with as many as you can, furthering both your knowledge and respect for these majestic creatures.